Last week the WebRTC World Conference and Expo took place in Miami. Overall it was an exciting conference and a great view of where WebRTC is today and where it is going. While the conference did not start formally until Tuesday morning, a group of developers took part in the WebRTC University starting on Monday afternoon with Dan Burnett and Alan Johnston, getting a hands-on learning and certification in WebRTC technologies and development. The conference started off with an exciting presentation by Serge Lachapelle of Google. Serge talked to how WebRTC is developing, the rapid advances in VP9 and how it enables higher quality video at about 40 percent less bandwidth by taking advantage of current processors. The conference then focused on both developer and business applications tracks, including keynotes by Peter Dunkley of Acision and Jason Unrein of AT&T. Jason talked to the recent API announcements from AT&T that open up the developer interfaces to the AT&T network to WebRTC developers. A major announcement was a partnership between Temasys and Citrix where Citrix is using the Temasys plug-in for Internet explorer and Safari in the Enterprise to enable the Citrix WebRTC-based solution to operate where users want or are required to use those browsers. In the “Deploying WebRTC Successfully” session, the question of the need for identity and federation between WebRTC systems became a major point of discussion, with the traditional need for identity and interoperation contrasted with the Web mechanisms of open connection and identity distribution. The day wrapped up with a reception and a lot of networking and dialog. Wednesday started off with keynotes from Chip Wilcox of Temasys and John Riordan of OnSIP. While Chip talked to the challenges of scale and deployment, John discussed how WebRTC is a logical progression of the cloud solution offers that OnSIP is delivering. The day continued with a number of exciting sessions. In “Advanced Customer Care with WebRTC”, Kris Hopkins of CafeX said that only 30 percent of contact center video is integrated into an existing system; the majority is in separate deployments. The luncheon keynote by Trent Johnsen of Hookflash focused on where the industry is and a bit on ORTC. The afternoon sessions concluded with keynotes by Gregg Yedvarb of NCR and Matthew Hodgson of matrix.org. Gregg was particularly interesting in the video terminal division of NCR. He talked about how terminals and kiosks are changing many industries and how NCR sees WebRTC as being a major component in the space. Mathew focused on the progress that matrix.org is making in their multi-faceted open platform. Thursday focused on sessions with an interesting discussion with Vidyo about the relative roles of WebRTC versus optimized proprietary stacks in advanced video solutions. The day closed with an engaging discussion about signaling and the impact of SIP closing along with a hands-on (or code deep) session on Web components by Sumit Amar of Electronic Arts. The conference concluded with a wrap up on what we learned and where we are going. In the closing session, I reflected on how much the conference focused on WebRTC being implemented in mobile, a fact reflected by many over the three days. 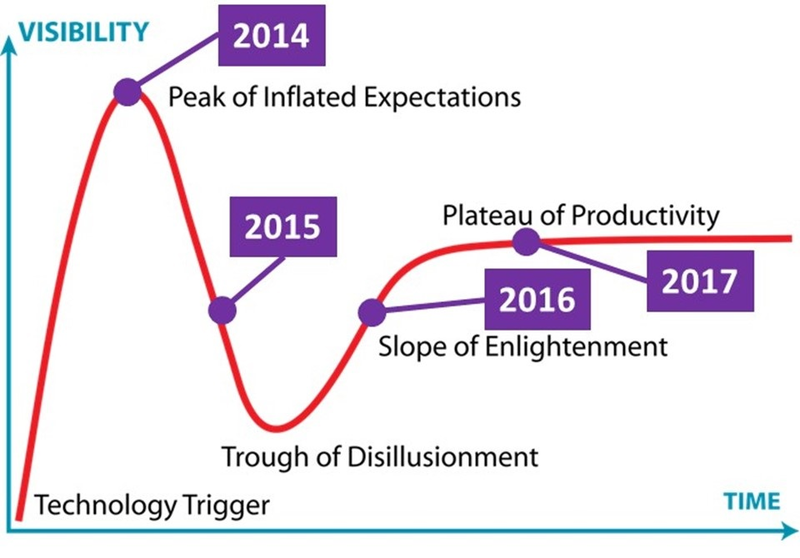 Finally, I put up my view of where WebRTC is on the much-famed (and mis-used) Gartner hype cycle. As you can see, I believe we are in the downward slide to the valley of despair. For reference, Trent Johnsen showed WebRTC on the climb, not yet reaching the peak of inflated expectations, while Mathew Hodgson of matrix.org argued we are already on the slope of enlightenment, as evidenced by Facebook users making over 1 million calls on WebRTC in the first two days. Regardless of how we see this in the future, one thing is clear, WebRTC is maturing, so the need for a North American event every six months is changing. With this in mind, it was announced the next WebRTC Conference and Expo will be on the west coast in the spring of 2016, though there will be a WebRTC focus at both of the coming ITEXPO events in Anaheim and Miami.